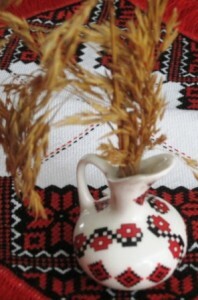 Ukrainians have many rich traditions associated with the celebration of Christmas. Many of them have been modernized to accommodate everyone’s busy lifestyle, but others are still kept original, and passed on from generation to generation. While the cooks are preparing the meal, other family members, and especially the children, are kept busy by decorating the Christmas tree.The youngest children are patiently gazing out the window for the first star to appear, since this is a sign that dinner is ready to be served. Everyone is looking forward to this elaborate meal, since throughout the day only light snacking is allowed, or a total fast is observed.The dinner table is set with best linens and china, and a small sheaf of wheat tied with a festive ribbon, along with special bread “Kolach” shares the center stage on the table.There is an extra place setting on the table, in remembrance of the departed family members.A prayer is recited by the whole family, a special Christmas greeting is exchanged, and the dinner begins. After dinner, everyone engages in caroling of Christmas carols, children have special poems to recite, or perform a small concert prepared ahead of time.Some presents are opened at this time, but most are left to be opened on Christmas Day.At midnight everyone attends a Devine Christmas Liturgy, which lasts about 2 hours, but is very beautiful and filled with caroling and chanting.Children bring a gift to church to place by the manger, to be distributed to the less fortunate children in the community.With the old tradition, there were no gift exchanges at Christmas, only candy and sweets, but St. Nicholas was bringing gifts on December 6th, and placing them at night under the pillow, for all the “well behaved” children. On Christmas Day the celebration continues.The children open the remainder of their gifts, and a lot of caroling, and visiting of family and friends, is taking place.There is no more fasting on this day, but rather a lot of meat dishes are being served, and delicious desserts are plentiful in every household.Carolers are going from house to house to carol for their friends and family, and are welcomed with snacks and sweets. The Polish Christmas traditions are very similar to the Ukrainian ones, with the meatless Christmas Eve dinner, the midnight Liturgy “Pasterka”, and the caroling for friends and family.One of the differences is the use of an unleavened wafer with honey, to share at the dinner table, rather than the “kolach” bread that the Ukrainians use. The Italians also begin their Christmas celebration on Christmas Eve with a large meatless dinner, and attend midnight Mass afterwards. The German children used to leave a wooden clog outside the door, for St. Nicholas to drop in presents. nice web site–great recipes. It’s so nice to see you share your wisdom. Thanks for mentioning Italians in your christmas tradition. Good to see. We had sooo much food not to mention 26 trays of cookies and cakes what an overload.!!! Merry christmas –happy new year. Keep up your recipes. Love to see your nut cup recipes. Thank you for visiting my site. It’s still in its infancy, but I will continue to work on it as much as possible. I will share lots of my favorite recipes, and will make sure to include the nut cups. I love your website and will be saving as one of my favorites. I was especially excited to see this post on culture. I do believe that I could honestly sit and listen (or read) for hours on end! This is just the beginning…….I plan to share many more stories on culture and other subjects, tying them to recipes, crafts, pictures, etc. If you have any stories you would like to share, I will be more than happy to post them on my web site. The cognac is sometimes substituted for the baked beans.